When it comes to storage on the go, USB flash drives are still the most preferred way of carrying around data. The combination of their small size and relatively generous storage capacity wins over a lot of people. There are more USB drive designs and capacities out in the market for one person to wrap his head around, but for the most part, the most successful designs fulfill the need for durability and portability that users have come to expect from flash drives. With the SanDisk Cruzer Orbit USB 2.0, durability takes the form of a swivel design; and portability, the form of a very pocketable form factor. The SanDisk Cruzer Orbit USB 2.0 flash drive is a mix of protective design and a small travel-friendly size. The most distinguishing feature of the Cruzer Orbit is its capless design. Instead of using the standard plastic cap (which is a pain to keep track of), the flash drives utilizes a 360-degree swivel design that uncovers the USB protector when in use and keeps it from damage when the USB is tucked away. Its small size also makes it easy to take with you wherever you go. Measuring just short of an inch and a half, the flash drive is easily attachable to key rings and lanyards. In terms of hardware specs and software, the Cruzer Orbit offers solid storage capacity and protection. The USB flash drive comes in four different storage capacities: 4 GB, 8 GB, 16 GB, and 32 GB. The capacities aren’t the biggest out there, but they do offer more than enough storage for daily use. The flash drive also features password protection and encryption software. Thanks to SanDisk Secure Access software, users can put passwords on folders that contain sensitive data. In addition to that, they can also opt for 128-bit AES encryption for an added layer of protection. And to make sure that the data in the drives don’t get lost forever because of theft or accidents, SanDisk gives its customers the option to backup and store data on an online cloud service. 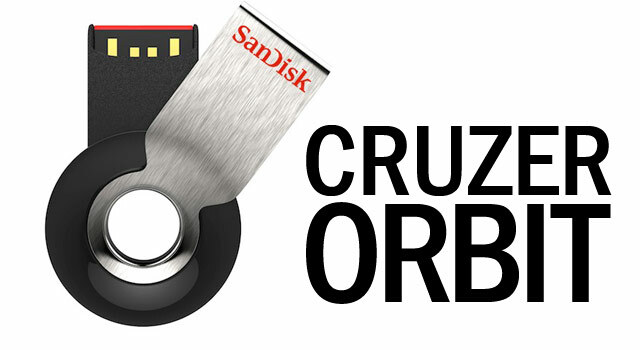 SanDisk’s Cruzer Orbit USB 2.0 flash drive is available through the SanDisk online store. As of now, unfortunately, there are no brick and mortar retailers of the flash drive for those who wish to buy the device in person. The retail price for the flash drive ranges from $8.85 for the 4 GB version to around $39 for the 32 GB version. This entry was posted in SanDisk and tagged Cruzer, Orbit, SanDisk, Swivel USB Drive, USB 2.0, USB Flash Drive. Bookmark the permalink.